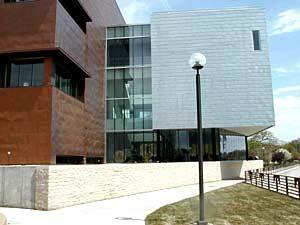 Rochester's getting ready to party this weekend to celebrate the opening of its new art center. Rochester, Minn. — It's hard to miss the new Rochester Art Center. Squares of eye-catching copper and weathered zinc coat the towering facade of the neo-modern building. The structure seems to float above the Zumbro River. The Art Center's Denise Sorom stands outside of the building, still busy with construction workers. Sorom cranes her head back and says the building seems almost like a sculpture. Already the building has generated a flurry of letters to the local paper. Some people love it. Some people hate it. Sorom says that's a good thing. "People are reflecting on something on an aesthetic level, and looking at this skyline saying, 'Wow, I don't like that,' or 'I do like that,'" Sorom explains. "That's really good -- to push people about thinking about our visual surrounding." It's a few days before the center opens and inside work continues. Carolyn Piepho navigates through the activity. She's spent the past five years raising more than $8 million for the project. Piepho stops inside a giant sun-filled atrium. It covers a big chunk of the first floor, and the atriums hang three stories above. Piepho explains the finishing touches to come, things like glass railings for staircases. She says when the scaffolding came down, she was amazed. "Gosh, the place has good bones. It has great bone structure," says Piepho. Upstairs, a team of art handlers helps arrange the center's first major exhibit. A pair of oversized ceramic heads, giant clay dumplings, and at least one brightly colored painting. They're all the work of noted Japanese artist Jun Kaneko. The old center could not have presented this show. For starters, Kaneko's work is huge. It simply wouldn't fit. Then there are issues like climate control, now available with the new center. B.J. Shigaki has been the director of the Rochester Art Center for more than 30 years. Shigaki was recently honored with the prestigious Sally Ordway Irvine Award for her initiative and tenacity in getting the new center built. Shigaki sits in a conference room in the tidy rectangular building that's housed her organization since the mid-1950s. It's just one-fourth the size of the new building. She expects it will be demolished once the move is complete. Shigaki says the project's timing was key. "It's not something that just happened. I think that everyone would agree if this was something that we started right now ... we would have a very a challenging time," says Shigaki. "But we just happened to get in before the economy took a turn." Supporters point out the project came together without any state bonding money. Instead, the city of Rochester donated more than $3 million, at least three foundations donated another $1 million, and countless businesses and individuals helped with the rest. Shigaki says she's overwhelmed by the new space. There's an entire floor dedicated to arts education. There are plans for an emerging artist series to highlight works from around the region. And Shigaki hopes the center will at least temporarily house a series of traveling exhibitions. "In 1946, the founders of this organization -- in part of their mission statement -- said they hoped the art center would develop in a way that meets the scientific reputation of this community," Shigaki reflects. "In 1946, they always had high aspirations for this center. And now finally coming to this new building, I think finally we'll meet that goal." The center is expected to draw visitors from three surrounding states.